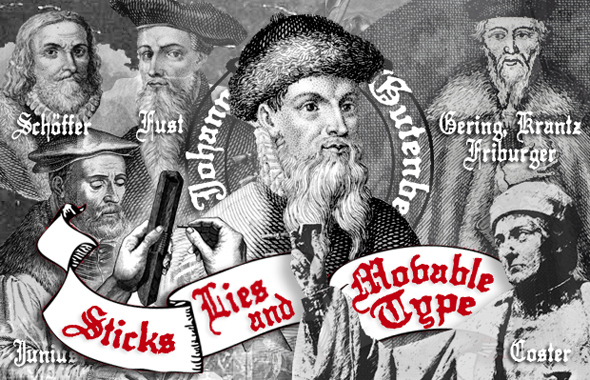 It has been widely accepted today that Johannes Gutenberg was the inventor of the printing press and process using movable type. Yet for centuries following the invention, the identity of the true inventor of the craft had often been questioned and fiercely contested by scholars and historians. Greed, deceptions, lies, whether for personal profit, national pride or family honor – whatever the motivations were behind the mostly unsubstantiated assertions, during the 300 years after Gutenberg completed his 42-line bible, various claimants had attempted to unseat his place in history. Here is one of the articles on the subject published in November 1884 issue of Inland Printer. In the number of the 10th of October, Le Livre, has given prominence to an article of M. Dutent, devoted to the interesting question, “Who is the Inventor of Printing?” the article being extracted from a new manual for the amateurs of engraving, written by one who had labored for many years on the rich library at Rouen. The author brought forward with much clearness and reviewed with considerable sagacity the texts of the principal known documents, distinguishing, after the example of Mr. Hessels, the pieces that were certainly apocryphal and those that were suspected of being so. This conclusion is a sensible one, and his opinion may be regarded as impartial, being altogether devoid of the blindness, which the spirit of patriotism often induces when such questions are treat of. It was in the Low Countries, evidently, that the first attempts at printing were made. Whether these were of the nature of block printing, originally, and whether later on they made use of letters separated one from the other, either engraved on wood, or on lead, or founded or cast by some imperfect process. The fact is that what it is convenient to call the Dutch school, or that of Haarlem, has not left any products of the art that are not merely rudimentary. The story, told by Junius, of a workman named John, who in the middle of one Christmas night, stole the types and materials of Coster, and then proceeded with them to Amsterdam (then a place of no importance), thence to Cologne, and afterwards to Mayence, where he printing in 1442 certain books similar to those of Coster, with the type and utensils belonging to his former master, is in the last degree unworthy of belief, and ought to be regarded merely as a fable. The invention of a man of genius, the true practical secret of printing with movable types, such as that connected with Mayence, has no relationship with the legend of the dishonest workman. In fact, printing could only have been invented in this way. The experience of one man is taken advantage of by another, and the failure of one is a guide to his successor. From mistakes and failures knowledge is derived. The first ill designed efforts give place to better processes. A man of intelligence, laboring and experimenting by himself, ultimately utilizes the experience of his predecessors, and, avoiding their errors, evolves a process, an art and an industry, in reality – and of this he was in reality, as was declared by his contemporaries, the inventor. Such was the position of Gutenberg. The document appended, which is not known to any historian of printing, is of prime importance; for in it Gutenberg is asserted to be the real inventor of typography, as it exists even in the present day. The value of these statements must be striking to every reader. We find here besides a eulogium on printing, the name of its inventor. This is the authentic testimony of makers of books by a new process. Who were these strangers, the new comers? One was named John, surnamed Gutten-Berg, who was the first to invent the art of printing. This is clear and precise. We must now see who those were who became guarantees of Claudin’s assertion. These were the master printers who brought to Paris the new art which it is said Louis XI induced to stay in Paris, and which the Prior of Sorbonne called the Germans. Among these three master printers, we find Martin Krantz, who was the son of Peter Krantz, who figures as a witness in the second trial of Gutten-Berg, at Mayence, in 1455. The two others, Michel Friburger and Urich Gering, were also well known. They came from Basle before they established a printing office in Paris. There can be no doubt that the testimony of these three printers may be relied upon in regard to the inventor of the art. They brought with them to Paris the secrets of its origin, and in this way announced to all the world the name of the inventor of their new industry. Fichet edited their Declaration, which they signed for the benefit of posterity. Here certainly is a document which may be called contemporaneous, as Gutten-Berg died in 1468, and the testimony authentic and undeniable just before, not hitherto discovered, the very earliest known up to the present time being the “Chronicle of the Popes” by Philip de Signamine, in addition to those of the “Chronicle of Cologne”, etc. The date of the letter of Fichet is easy to fix. The book is, it is well known, the second one printed in Paris at the Sorbonne. The first book printed at Paris was issued at the end of the year 1469, or at the beginning of 1470. The preface of book now under notice being dated in the month of January, the first of the three last months of the year, when it was begun at Eastertide. It therefore follows that the letter of Fichet to Gaguin is at the end of the same year, namely 1470. Dr. Ingram remarked that there was no copy of the Orthographia in Trinity College Library. As to the main question – namely, who was the author of printing in Europe – he feared they must be content to remain in an agnostic state of mind. Mr. Richard Garnett stated that he had had in his possession a copy of a work by an Italian writer of the sixteenth century, Passi, in which he stated Gutenberg learned the art of printing from a Chinese through the medium of the Russians. Passi mentioned that he had seen Chinese work which had been presented to Pope Leo X by Portuguese, and learning from these that the Chinese were acquainted with printing, he formed his theory respecting Gutenberg. Mr. Bullen remarked that the art of printing from blocks might have been introduced from China, but the real printing was printing from movable types, and printing from movable types was known in Japan and the Corea before the introduction of printing in Europe. The British Museum now contained 300 volumes which had been purchased from Her Majesty’s Consul at Bangkok, and Professor Douglas had assured him (Mr. Bullen) that some of those works were printed about 1417. Mr. Harrison (London) remarked that the irony of fate was shown in the fact that Fichet, who wrote of the art of printing as perpetuating the memory of man, did not get his own letter made known until 400 years after it was written.